Luca Williams graduated from the Rolf Institute of Structural Integration in 2005 at Boulder, CO. Instruction at the Rolf Institute includes anatomy, physiology, kinesiology, Rolf Movement and movement analysis. She has been a Licensed Massage Therapist in Washington State since 2005. Recently she trained in a 60 hour Thai Yoga Massage class and beleives that Thai Massage compliments Rolfing well. She has studied yoga since 1995 and completed Ashtanga yoga teacher training with the Samarya Center and Beryl Bender Birch. Luca received degrees in Biology and Spanish in 2000 from WWU. 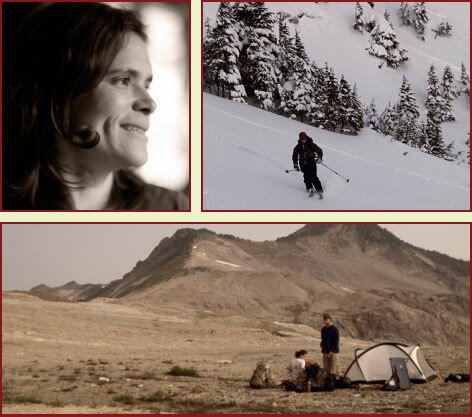 She worked for the Forest Service as a Wilderness Ranger and Trails Technician for ten years. She volunteered at the Children's Rolfing Clinic for 7 years giving her great experience working with children of all ages. Luca has worked with a diverse range of clients including yoga students, loggers, welders, firemen, carpenters, runners, professional skiers and snowboarders, bikers, circus performers, drummers, and guitarists. As each person is unique, each session is custom-fit in order to help that person stand taller, feel better, and have more energy for the activities they love. Biodynamic Craniosacral I with Michael Shea October, 2005. Cranial Release and Balancing I, II, and III with Michael Maskornick Certified Rolfer 2006. Anat Banial Method. A long time student of Moshe Feldenkrais. First Segment of the Teacher Training, February 2009. Portals of Perception with Advanced Rolfer Hubert Godard and Continuum Practitioner Susan Harper May, 2010. To schedule an appointment call Luca Williams, Certified Rolfer, at (360) 599-3172.